Linda Clarke, archivist at Cheshire Archives and Local Studies, leads this talk about Mrs Gaskell and how her famous biography of her friend Charlotte Brontë came about, supported by artefacts from the Collection. This fascinating talk will include early copies of the biography, various letters to and from Patrick Brontë, and photographs. The Whitfield Collection is Mrs Gaskell’s private collection of books, letters and cuttings and is usually housed at Knutsford Library. Many people will know Mrs Gaskell’s work from her novels, but it might be less well known that she was a close friend of Charlotte Brontë and wrote her biography at the request of Charlotte’s father Patrick. He was impressed by Mrs Gaskell’s honesty and style of writing. The biography ‘The Life of Charlotte Brontë’ was published in 1857, after Charlotte’s death. 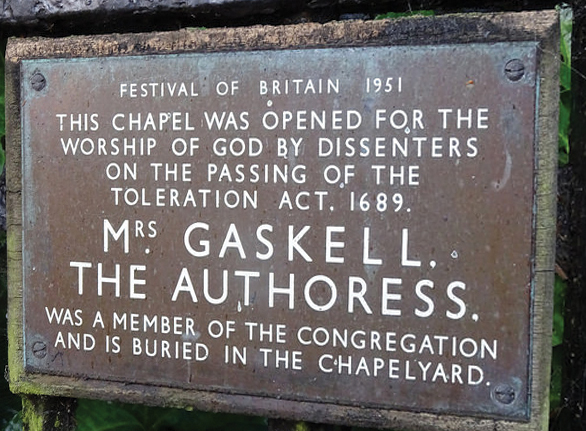 Brook Street Heritage site comprises a Grade I listed Unitarian Chapel built 1687 – Knutsford’s oldest place of worship – and exhibition rooms featuring Elizabeth Gaskell’s early years in Knutsford. Elizabeth, her husband William Gaskell and two of their daughters are laid to rest in the graveyard. Cheshire Archives and Local Studies collects, protects and promotes interest in and the use of records and printed material relating to the historic county of Cheshire. 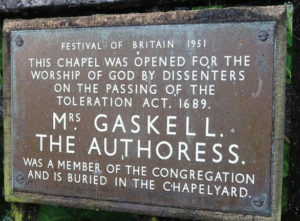 Visitors will be interested to know that Elizabeth Gaskell attended this chapel every Sunday with her Aunt Lumb and when she got older became a Sunday School teacher.